Anna and Markku Lumikivi’s love story is something special. So special it gives me goose pimples to bring it to you. I first bumped into Anna on a wedding forum on Facebook. 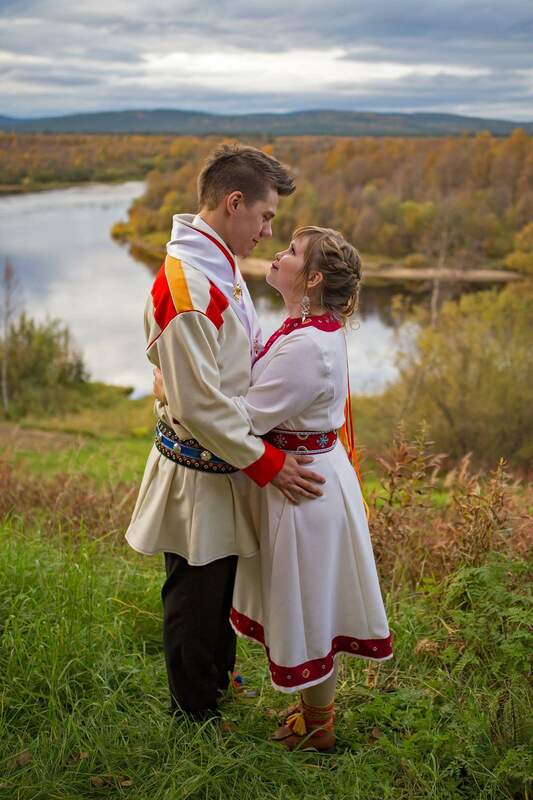 Anna’s wedding dress really stood out because it looked like a traditional Sami dress. But little did I know that the story behind that dress and this couple would sweep me completely off my feet. Yes, me, the old anarchist! Now let me take you on a journey to Ivalo where the two lovebirds met. 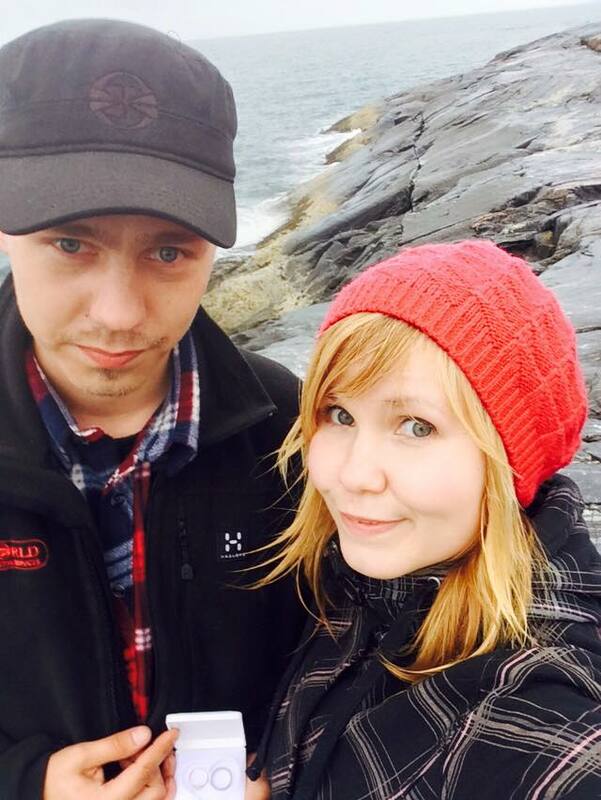 When Anna Lumisalmi (29) and Markku Kiviniemi (27) met at Christmas 2013, it was love at first sight – even though neither of the Ivalo-born young singletons believed in love at first sight. Both had had their fair share of heartache and were holding their guards up high. Still, on the night they met at a friend’s after party at Markku’s place, Markku told Anna he hoped she would still be near him in a year’s time. Anna hadn’t felt “at home” with anyone in a long time and with Markku she felt safe. On the second date both knew they wanted to grow old together. And that was that – no messing about. With anyone else I would have been like a deer in headlights, but not with You. With You I knew I could be myself. For the first couple of months Anna and Markku WhatsApped. A lot. Then Anna managed to get a job interview at Hotel Ivalo, leading to a summer job as a Receptionist and finally made the 953 km move away from her comfort zone – the hustle and bustle of the city. The return to Ivalo meant a number of changes for Anna. Cafe lunches out with friends became staying in and seeing friends at their houses. 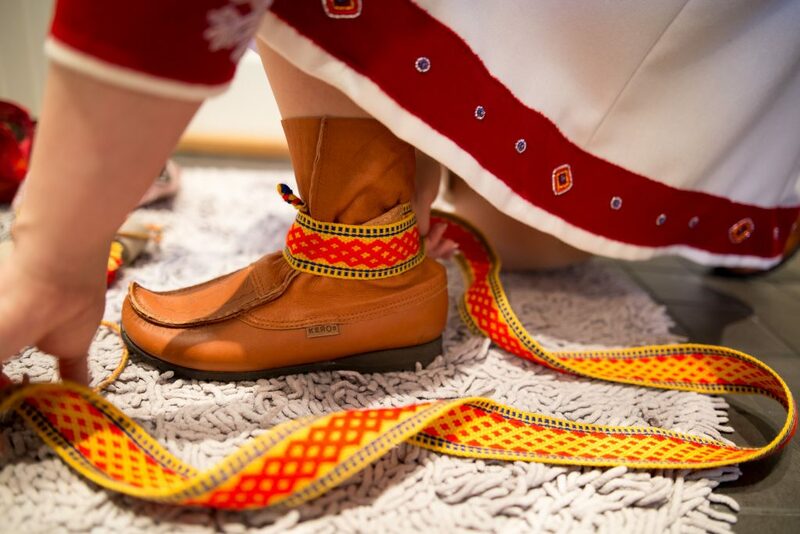 Lucky for her, Anna is a home maker and had soon mastered even the traditional Skolt Sami crafts. Having “two left hands” as she puts it, was not going to get in the way of her settling in. Instead of suffering from reverse culture shock, Anna seemed to thrive back in Lapland. Returning to her home town also made her want to change her musical language to Skolt Sami. She began studying traditional Sami music in Utsjoki, 165 km from Ivalo. Watch Anna sing on this beautiful video, which was made close to the spot where Markku proposed to her. Even though Anna by this stage had clearly committed herself to building a future with Markku, the proposal came as a surprise. Markku knew that Grense Jakobselve, by the Norwegian Sea, was very special to Anna and that’s where he decided to take her. Markku nervously held the rings in a selfie taken by Anna. The moment she realised what was going on came after this pic! The couple set their wedding date and the planning began. But without the usual stress – Anna and Markku are two people who seem to have managed to ‘delete’ it from their lives. (Well, Anna does tell me they have their “moments”, but you’re getting the picture…) There was no Pinterest theme to their big day. Instead, Anna and Markku drew their inspiration from local nature, famous for its autumn colours. Every little wedding day detail had to have a meaning in their story. The couple also accepted help from anyone who wanted to take part in their wedding preparations, creating a unique community spirit. The wedding venue, Törmänen Village Hall (Törmäsen Keidas), was chosen because it was close to – well, on the opposite side of the road of – Markku’s childhood home. Markku’s grandfather was one of the founding members of the hall. It must have been a while since the rural village had seen a wedding as the hall now needed more than a bit of tlc! 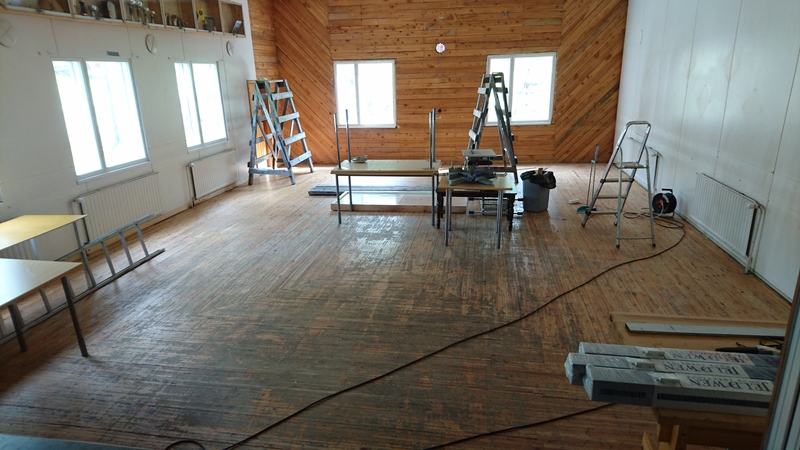 But that wasn’t a problem for Markku and his local community: they wanted to give the place a new lease of life. New internal walls needed to be put in, the external walls were desperate for paint, floors needed doing up and new windows and doors had to be put in. Over the summer they just got on with it and whatever didn’t get finished could be finished after the wedding. How’s that for relaxed? 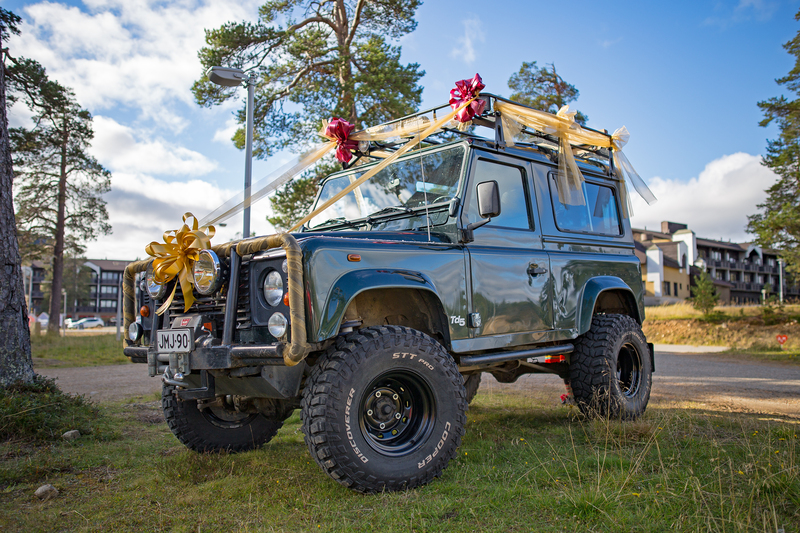 The couple also chose their wedding car – a Land Rover Defender – to make them feel at ease, as Markku loves off-roading. The fact that Anna and Markku were offered so much practical help in the run-up to their big day that they had to turn some of it down, says a lot about the community they want to spend the rest of their lives in. The wedding cakes (in Finland there isn’t just the one) were made by Markku’s Mum, sister, aunt and Anna’s bridesmaids and friend. The decorations were made with the aid of Anna’s friends and Markku’s sister. The bride’s hair and makeup were done by a friend and bridesmaid. The list goes on and on! And of course, no-one asked for anything for their time and efforts – a rarity in the commercialized world we live in. Anna and Markku’s wedding ceremony was held at The St. Paul ecumenical Chapel in Saariselkä, up in the gorgeous fell scenery. It was an Orthodox service – Skolt Sami people have traditionally been Orthodox, as are 1.1 percent of the Finnish population. Anna’s Dad directed the music during the service. 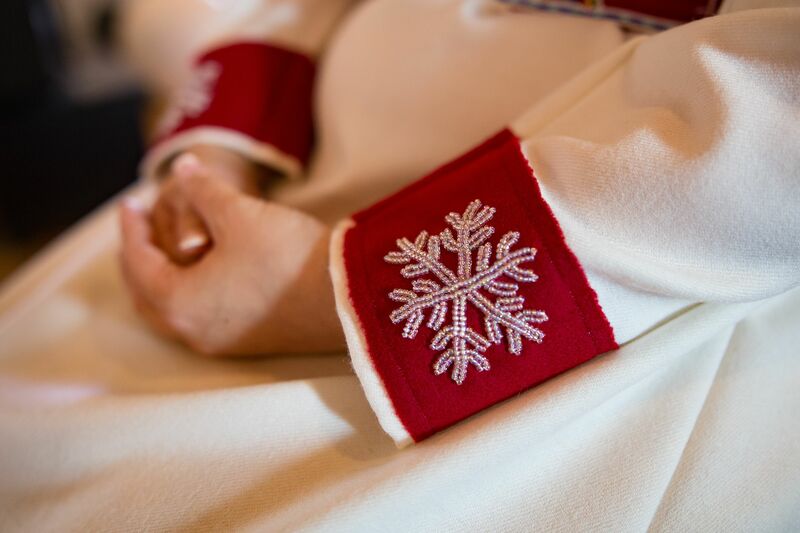 Markku’s traditional Sami wedding suit was made by his Mum and both Mums were involved with the making of Anna’s beautiful dress. Most of the work on the gown was done by the feisty little bride herself. 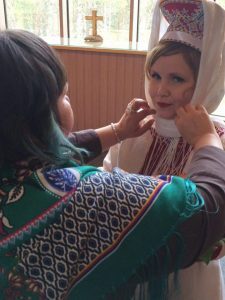 One the most unique parts of a Skolt Sami wedding ceremony is the changing of the bride’s headdress. A headdress tells the world the marital status of a Skolt Sami woman. Anna, of course, wanted this to be part of her ceremony and had her godmother and bridesmaids to help her change her status to the one of a married woman. A quiet ritual carried out in a private room in the chapel. The first thing Anna wanted to do as a married woman was to make a speech to Markku, her now husband. Markku also made a speech to Anna at the wedding. The couple’s marital name, Lumikivi, is a fitting combination of both of their surnames. The beautiful wedding pictures of Anna and Markku Lumikivi were taken by Terhi Tuovinen. The picture of the change of the bride’s headdress was taken by Annukka Hirvasvuopio-Laiti. Onpa todella hauskaa kuulla nimen aikaisemmasta historiasta! Tiesimme etukäteen vain Väestörekisterikeskuksen nimipalvelusta, että Lumikivi-nimi on ollut käytössä alle viidellä (jo kuolleella) henkilöllä, mutta emme ole aikaisemmin tienneet sen enempää. Haimme siis Lumikivi-nimeä uutena sukunimenä, joka yhdisti aikaisemmat sukunimemme Lumisalmi ja Kiviniemi, ja nimilautakunta sitten myönsi nimen miehelleni kesällä 2016, ja naimisiinmenon myötä siitä tuli myös minun sukunimeni.